Many immigrants joined mutual aid societies, which gave them a way to pool their financial resources to help members in times of crisis. Cuban immigrants in Tampa established El Bien Publico ("The Public Good") to provide medical services to their community. 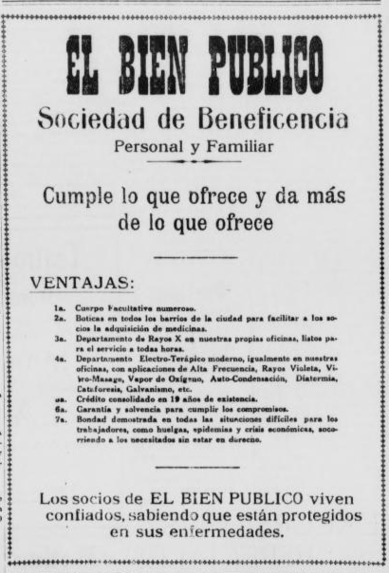 This advertisement for El Bien Publico appeared in a Tampa Spanish-language newspaper in 1923. A translation appears below the image. We fulfill all our obligations and more! 1. Large number of physicians. 2. Pharmacies in all neighborhoods of the city to facilitate members' access to medicines. 3. X-Ray Department in our own offices, ready to serve you at all hours. 4. Modern Electro-Therapy Department, also in our own offices, with high-frequency, violet rays, vibro-massage, oxygen-vapor, auto-condensation, diathermy, electrophoresis, galvanism, etc. 5. Credit built up over 19 years of existence. 6. Guaranteed to meet all contractual obligations. 7. Demonstrated compassion in difficult situations for workers, such as strikes, epidemics, and economic crises, helping those in need. Members of THE PUBLIC GOOD live with confidence, knowing that they are protected in times of poor health. Source | La Gaceta, September 1, 1923. Cite This document | El Bien Publico, “Advertisement for El Bien Publico,” HERB: Resources for Teachers, accessed April 20, 2019, https://herb.ashp.cuny.edu/items/show/2401.